The ART (or "Artist") SERIES was an attempt by the Organizing Committee to invite famous artists to express their ideas on the Olympic Games and human movement. Otl Aicher, a German graphic designer, was in charge of the project. Click here to see the 28 ART SERIES posters with my prices. The SPORTS SERIES posters were used for advertising the Olympic Games and as directional posters. Extra large posters were used as an aesthetic way to direct the public to the various sports venues. The visual image of the sport became the international language to replace German, English and French language signs. Foreign visitors could easily find their way by following the colorful posters that were placed all over the city including bus terminals, train stations and locations near each sport venue. Smaller posters were sold to the general public as a souvenir. Click here to see the SPORT SERIES posters with my prices. some background, history and general information -- but not prices. To see the posters with my prices -- please click on my linked pages. This set consists of 28 designs by various famous artists who were selected by the Organizing Committee. The Organizing Committee for the 1972 Munich Olympic Games decided to produce a series of artistic posters to "represent the intertwining of sports and art worldwide." Because the financial investment was too much for the Organizing Committee, they decided to form a partnership with a German publisher and formed a new company called Edition Olympia 1972, GmbH -- (translated as: Olympic Editions 1972, Ltd.), which was founded in Munich in 1968. The contract with publisher F. Bruckmann KG gave two-thirds of the profits to the Organizing Committee while Bruckmann kept one third. By the end of 1972 the Organizing Committee had received nearly two million Deutschemarks (2,000,000 DM) from the sale of posters. Class 1 - "Original graphics": prices in 1972 ranged from 300 to 800 DM each. This was a limited edition of 200 (two hunded) prints, each individually signed and numbered by the artist, the most valuable version in each design. Class 2 - "Original posters": In 1972 prices ranged from 30 to 70 DM each. This was a limited edition of 2,000 (two thousand) prints according to the Official Report, however I can verify that there are either 3,999 or 4,000 in this limited edition. To date I cannot verify the differences - but my theory is that the original contract allowed 2,000 to be printed for Germany by Bruckman and another 2,000 were printed for Kennedy Graphics of New York. All of these prints are signed in the stone. The term used in the American graphics and print industry is "limited edition prints." The signature is printed onto the paper as part of the printing process and is not in pen, ink or other medium. Class 3 - "Reproduktions" ("Reproduction" in English): originally priced at 10 DM each. This is the most confusing term for most collectors. These are actually the open edition posters - the Germans used the word "Reproduktions." But in the USA these are called "open edition posters" meaning that they are printed as needed, no limits, whatever can be sold to the public. The posters were printed in 1970 and 1971 and have not been reproduced since then. Some of the posters have the German word Reproduktions Plakate in the lower left corner which means it is this "open edition" and not a reproduction made in recent years. The original meaning in German was to identify this poster as a "reproduction" of the original artwork. My pages have prices for the OPEN EDITION POSTER - Class 3 above. These are all ORIGINAL posters - not reproductions! They were printed in four series in 1970 and 1971.
so that most of Class 2 and Class 1 are now available in very limited quanitites. A 29th poster, the official design of the Munich Olympics entitled SPIRALE, was also produced in a larger format and as of July 2011 is available again in my inventory. In my 1995 Catalog 14 I incorrectly identified this poster as part of the ART SERIES because of the way it was advertised in the USA. In truth it was designed as the official symbol of the Munich Olympics. I have also been informed -- by a member of the artist team that assisted Otl Aicher -- that the Spirale was never offered to the public for sale. But I think he meant in Germany because a poster was printed for the USA market in a limited edition of 3,000 prints. The story behind the entire graphics program is quite fascinating! It was a lengthy and demanding effort for many artists in creating a logo design. Otl Aicher was the design commissioner for the Organizing Committee. He originally submitted his design of a "wreath of rays" in September 1967. The Organizing committee did not like it and instructed Aicher to make alternative designs, which he did. By November 1967 the Organizing Committee still did not like his submissions and they decided to have a competition for the logo. The competition was then opened to all German artists. By April 1968 there were 2,332 designs submitted and they were all rejected. 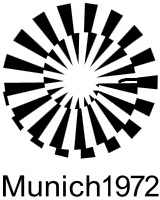 On May 8, 1968 the committee went back to Aicher's original designs and chose an alternative - his wreath of rays within a spiral. The design by Otl Aicher was refined by another graphic artist, Coordt Von Mannstein of Koln who used a mathematical concept to make it a three dimensional optical illusion. The design was then further refined - in color - by Victor Vasarely, and is frequently mis-identified as a Vasarely piece in art literature. This symbol was then used on all Munich Olympic publications and ads. In addition to the Spirale design, Aicher created the numerous pictograms used for each sport. Aicher also selected the color scheme of muted pastels with the intention of not using any colors that were previously in the National Socialist (Nazi) flag from the World War II era. The colors red and black are nowhere to be found in the 1972 Munich Olympic designs. MEASUREMENTS: All ART SERIES posters measure 25 x 40 inches. CONDITION: All posters offered are in near mint condition. This means that the posters are as close to new as they can be, but keep in mind that they have been moved from Munich to Berlin, where I lived from 1982-1987, then onward to the USA and into my warehouses over a period of several years. So -- they have been touched, rolled, unrolled, stacked, etc. The posters are presently stored flat but are shipped to you rolled in tubes. MY PRICES: My price range is $45.00 to $ 95.00, with 11 posters priced over $100.00. The complete set of 28 posters listed above is valued at approximately $ 2,900.00. A complete set of the limited edition posters (Class 2) would be worth considerably more. A complete set of the limited edition graphics (Class 1 -- edition of 200) would be worth even more. However -- condition is a major factor in value and can detract from value considerably -- so these values are a simple guide. Here is the poster by the British artist Allen Jones, number 17 above. Poster size: 25 x 40 inches. A. Allen Jones -- Poster Regular price: $450.00 postpaid. on heavier stock paper.... Price: $895.00. Published by the Organizing Committee for the 1972 Olympic Games. Prices start at $200.00 and go up to $450.00 for these 1972 posters. These are the oversize posters that were used for advertising - not the smaller posters that were sold to the public. Two other posters were printed in this series but I do not have these for sale. These were the SCHEDULE OF EVENTS (Zeitplan) and STADIUM ROOF (Zeitdach). The MARATHON poster, number 14 above, was also printed but I have only seen one copy. I do not know if this was the "extra" poster printed for ATHLETICS by the Organizing Committee, as mentioned in the Official Report of the 1972 Olympic Games. See the SPORT SERIES list with prices - click here: Sport Series List. Credit cards - VISA - MASTERCARD & e-payments are available through MONEYGRAM services. Current Olympic Games Sales list.